Bouchons, canuts and traboules - tale of two rivers in French. It is half-way between anything and everything: from Paris to Marseille, from North to South, from the peaks of the Rhone Alps to the Mediterranean Coast. Ask anyone anywhere in the world to name the main city in France and their likely answer is indisputable: Paris. Well, anywhere else in the world, maybe, but here in Lyon the response might not be so obvious. Residents of Lyon are certain that their city would give Paris a dose of healthy competition. Lyon has its own Notre Dame, called the Basilica of Notre-Dame de Fourvière, and its own smaller version of Eiffel Tower, modestly named Metal Tower here. If it looks like a tie so far, that is because we have not counted the rivers yet. While most European cities have at least one, Lyon is blessed with two: the Rhone and the Saône. While Paris is the official, political capital of France, Lyon is known as its gastronomic capital. Lyon has enough Michelin stars to form a small galaxy, and more restaurants per capita than any city in France. If you happened to sample all of them and got fed up with their "three molecules and a drop of a sauce" portions, try the bouchons - small, often family-run bistros that serve decidedly unpretentious food. Or patisseries, world-famous cakes and pastries shops, where everything looks so tantalizing I had to fight the urgent temptation to seek asylum for a few days in one of them. In 1540, the King of France, noted art patron Francis I, granted a monopoly on silk production to the city of Lyon and so the Capital of Silk was born. Fabrics from Lyon became well known and treasured throughout Europe and later graced the walls of Marie-Antoinette's rooms in Versailles and the palaces of the Russian Empress, Catherine the Great. However, there is more to Lyon that meets the eye of an unsuspecting visitor. If you know the right doors to open, you can get into magic world of the traboules - narrow secret passageways that connect longer avenues and are burrowed literally through the hearts of the houses. Scattered throughout the Old Lyon, they're capped with vaulted masonry ceilings to create galleries, ancient wells, and even a spiral staircase carved out of the stone - a miracle of medieval engineering. The first traboules were built in Lyon in the 4th century, but played a role throughout the history of the city. Renaissance silk weavers - canuts - appreciated the idea because covered corridors protected the fabric from the rain and allowed it to be carried quickly from the workshops to the textile merchants. It became even more handy during World War II, when the secret alleyways were used by the Resistance to escape from Gestapo raids. While painting on the walls might be a pretty ancient French tradition (science dates the Lascaux cave images as far back as 40,000 years old), the artists of Lyon definitely took their skills to a new height. Nearly 60 enormous outdoor murals decorate the city, some of them covering the façade of entire buildings. Out of all the tall tales that the wall murals convey, the Fresque des Lyonnais is easily the most all-encompassing. It depicts all of the famous people from Lyon: Roman Emperor Claudius; the pioneers of film-making, the Lumière brothers; silk weaver and inventor of the Jacquard loom, Joseph-Marie Jacquard; founder of the science of classical electromagnetism, Andre-Marie Ampere; and the author and aviator, Antoine de Saint-Exupéry, all on their balconies as if they still lived in this house by the Saône River. 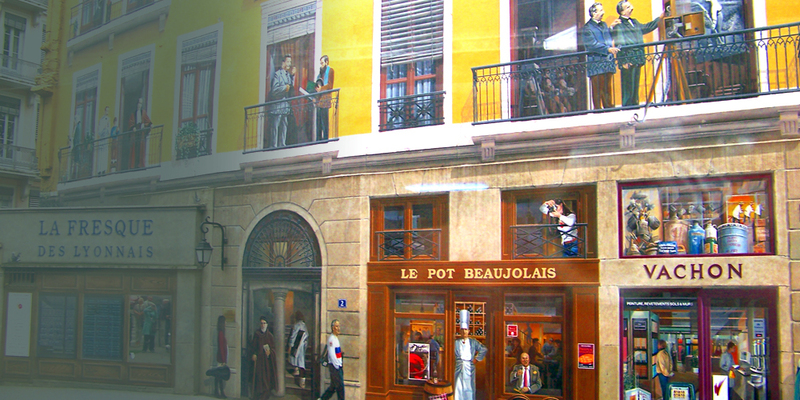 Down below, the famous chef Paul Bocuse stands in the doorway of a typical Lyonnais restaurant. In the end, even with all of its charm, history, and atmosphere, it still may be Lyon's central location and variety of transportation options that makes it the ideal base from which to explore the many regions of France. Just make sure that, before you will travel farther by train, plane, car or boat, try to spend a few days taking in the vibrancy of Lyon. It'll be a stopover that you will not only not regret, but will also treasure.